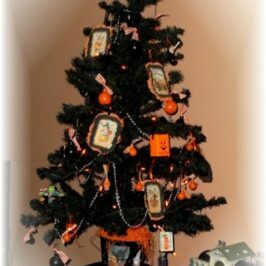 I’ve been spending this past week or so BUSY decorating for Halloween. 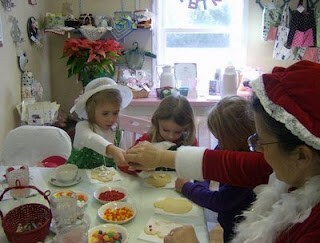 By popular request we are hosting a party again this year and I want everything to look amazing. I’ll be posting pics on my progress next week sometime. Today I wanted to share another “before and after” with you. You may remember last year I blogged about the new paint gun I bought (love it! 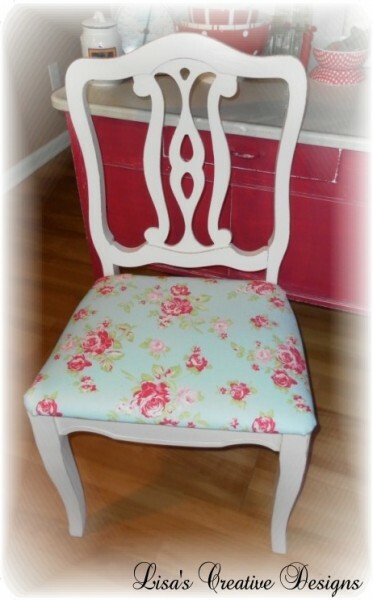 )and the makeover I gave to my kitchen chairs. I painted all of them a pretty aqua blue. You can view that post HERE . Well, I’ve lived with them for a year and it was time for a change. To be honest, I love the shape of these vintage chairs but because the legs are so narrow the legs kept falling apart. I must have reglued each chair 3 or 4 times and I was getting tired of it. Then one day my daughter was standing on one to get something out of the freezer and the legs gave out, spilling her to the floor. So I figured it was Time for them To Go! I started scouring local thrift shops. I had in mind what I was looking for. Something with great cottage style lines and an upholstered seat. My inspiration????? 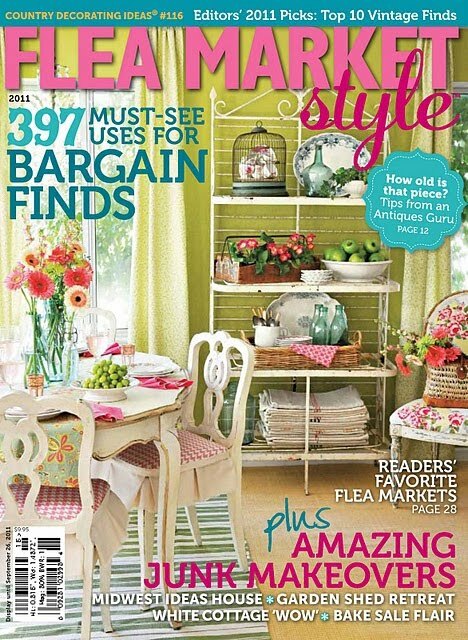 I had picked up the latest issue of Flea Market Style magazine a couple of months ago and fell in love with the chairs on the front cover. They are just adorable. So these chairs were stuck in my mind as I was traipsing through the thrift shops. That’s when I saw them. Three lonely chairs sitting outside my favorite haunt amidst second hand tables, chairs and dressers waiting to find a home. I got the three of them for only $20! They were perfect! 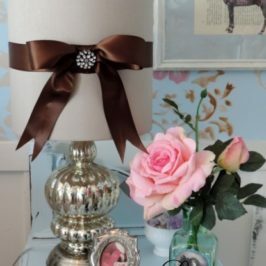 So similar to my inspiration pieces! They looked a little tired but were nice and solid. And what luck they had three. Because I was keeping the bench already at the table that’s all I needed! I brough them home, took the seat cushions off, sanded and gave each one a coat of antique white paint and lightly distressed them. I had in my mind I wanted to cover the seats in a fun aqua and red fabric that would compliment a red and white polka dot fabric I already had in the kitchen, so I started surfing the net. 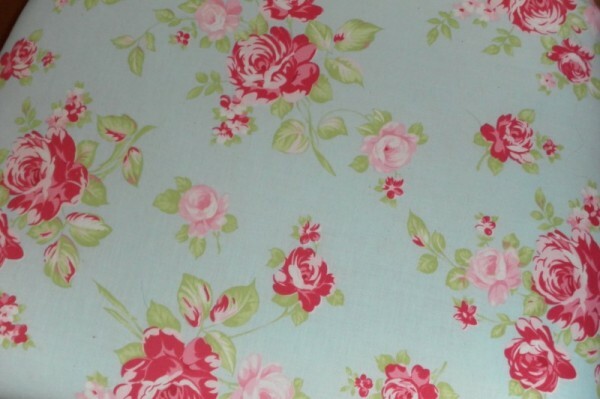 I fell in LOVE with this gorgeous aqua blue cotton fabric called “Darla Rose” by Tanya Whelan. 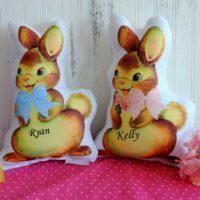 I found this beautiful fabric sold by the yard at CottageFlair.com . If you have never visited Jennifer’s site please do. 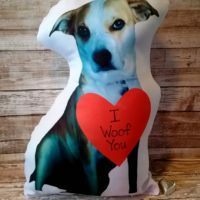 Her site is full of beautiful items! So, HERE is one of the chairs all finished! 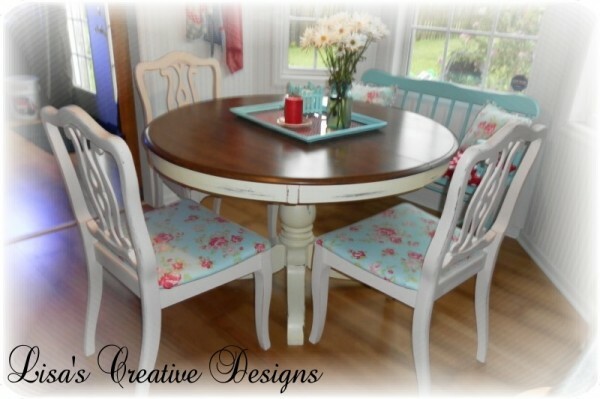 And here is my table and new chairs all finished….. I Scotch Guarded the seats on the chairs to protect them from spillage. With two kids and hubby in the house this was a must! I’ve been working on a couple of other projects in in my cozy kitchen as well. 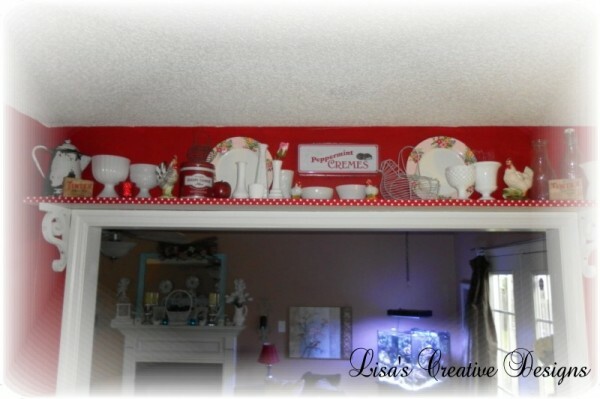 I attached a shelf above the doorway to display my collection of milk glass and some other goodies. Yes I am a collector. Minimalists would NOT love my kitchen but to me it is warm and cozy. 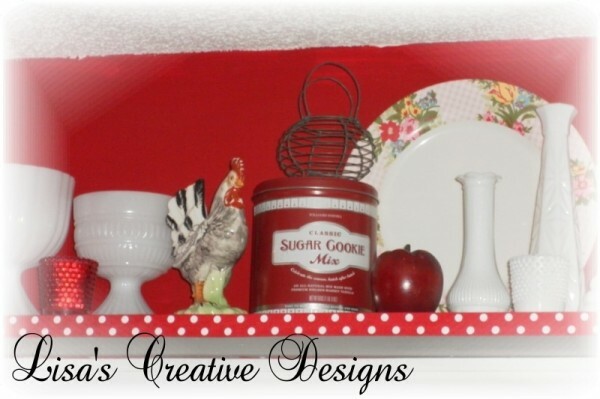 I painted a 1″ X 8″ board cut to fit the doorway, painted it white and attached it directly to the top of the doorway moulding and used some old brackets I found a few years ago on each side. I finished it off with a red and white polka dotted ribbon. I love it! My Mom laughs at my love for polka dots. 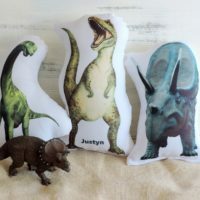 I just think they are so much fun and adds whimsy to a room. Well, that’s all for today folks. 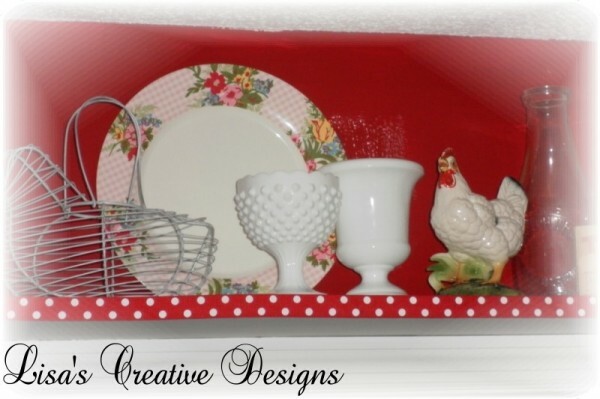 I will be sharing my other projects I’ve got cooking up for my kitchen as they are completed. They consist of recycling an old chandelier for above the table, fixing up a scratched laminate floor and building a new pantry out of recycled doors. Stay tuned! 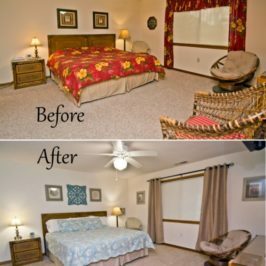 Hi Lisa, I receive your posts by email and am not always good about commenting, but I had to leave a note after seeing this makeover! You hit this one out of the park, girl! I love Tanya Whelan (she’s like an American Cath Kidston!) and pairing her florals with the polka dots is SO PERFECT. Those chairs look wonderful with a fresh coat of paint and the aqua bench really pops now. Throw in the polka dot ribbon and pom-pom fringe details and I’m in love with this space. 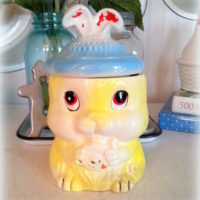 It’s so happy, and like you said, whimsical! Enjoy your updated breakfast nook! Thanks so much for commenting. I really love how it turned out. I have some left over fabric that I will be using in the near future on a couple of projects waiting to get started. I will post about them and when my cozy kitchen is all done I will be doing an overall kitchen tour. 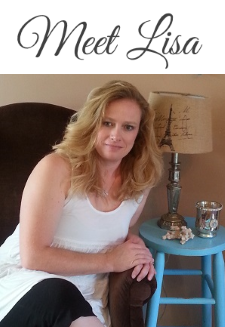 Thanks so much for reading my blog! I love the colors! Beautiful job! 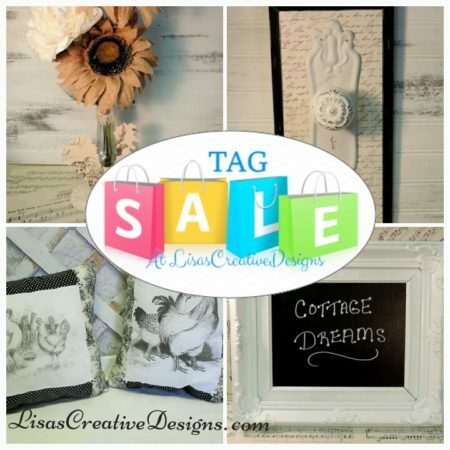 I would love for you to stop by and link up! I love your new chairs. They look so welcoming. I just want to park myself at your table and have a cup of tea. I especially like the fringe on the pillows on your bench. They remind me of pillows my grandmother had. I love your blog!! How cute! I love it! 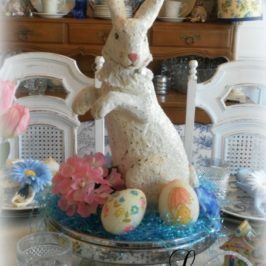 I hope you’ll link up on my new linky party here, http://www.coffeeandtheirkisses.com/2011/10/stitch-n-niche-saturdays-3.html. Love the color and pattern combination! So cute and cozy! The chairs look great with the bench. Really liking the polka dot fabric. And what a great deal on the chairs! All three for $20! Thankyou so much for all of the kind comments! I love what I do and am so happy to be able to share it! 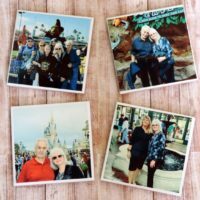 I found your site via Miss Mustard Seed and I have to tell you how much I love everything in every picture you posted here!! 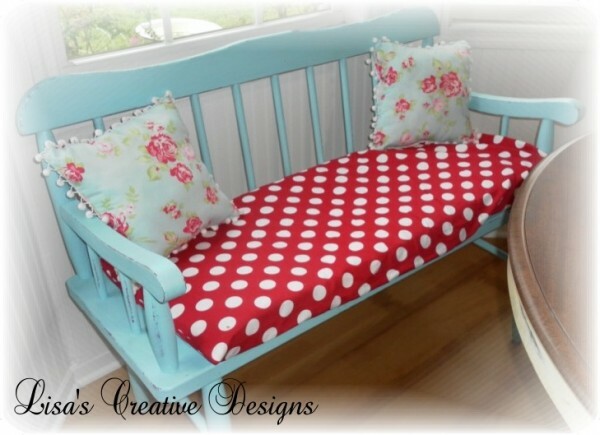 The polka dot cushion is perfect for that bench….I LOVE IT! Can’t wait to read through your blog. Also, is that not the best magazine? I still read that issue like it’s brand new!! That fabric is VERY similar to a duvet cover I got from Ikea! I just love the colours you’ve used and mixed together! Gorgeous! 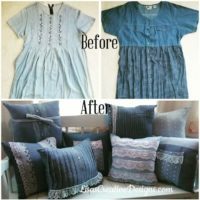 Absolutely LOVE your chair transformation…nice and sturdy now ‘eh…no more spills. Your kitchen is just so homey and comfy looking…all that red and aqua…just so inviting…you have a wonderful talent for putting things together beautifully! 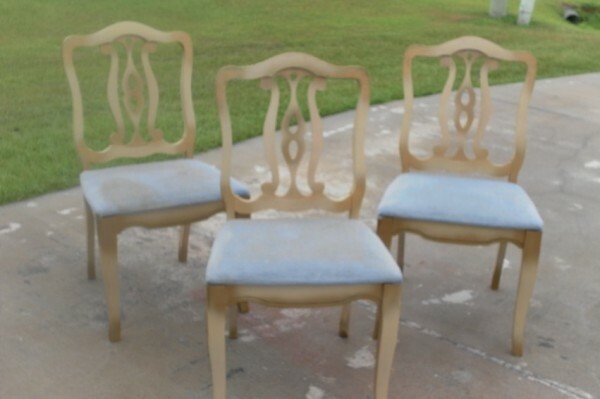 Your chairs turned out lovely! Thanks for stopping by Beach Cottage Good Life Wednesdays. K-U-T-E! I love what you did with the whole set. That polka dot fabric is such a fun element with the sweet floral on the chairs! I love love love the little bench!Great job on the chairs I love the fabric you chose. 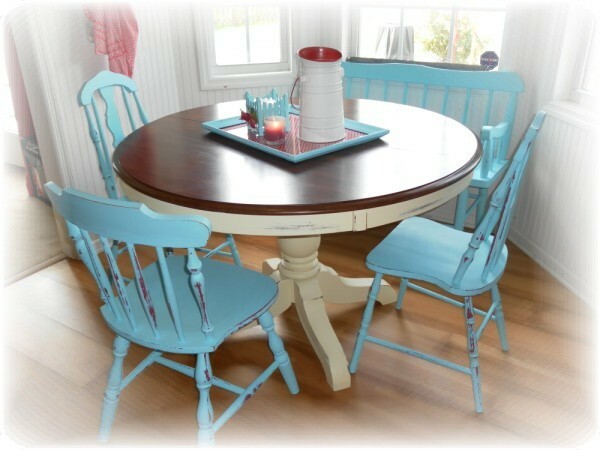 I love the painted furniture and the colors you chose. Darling! I love the chairs and the bench! 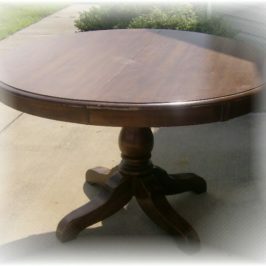 I have a very similar kitchen table waiting for a make-over – thanks for the inspiration!! I am a new follower! Love the chairs – and love the fabric!